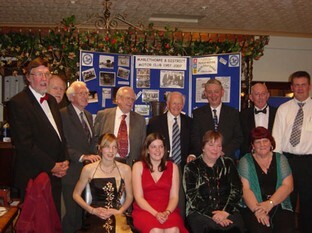 Mablethorpe and District Motor Club celebrated fifty years of motorsport activity in Lincolnshire and beyond during 2007. On Saturday 14th April the club held a gala dinner at Woodthorpe Hall Country Club with special guest speaker Stuart Turner. Stuart, involved in motorsport far more than fifty years (most renowned for being Competition Team Manager for both BMC and Ford in their respective heydays) gave a humorous speech recalling some of his early years and looking to the future of motorsport in Britain. The event brought together some of those involved in the early years of the club with today’s members. Raffle Prizes donated by Renault, Honda, Pirelli and Haynes Publishing added extra sparkle to the event. Thanks to them. During the presentations section of the evening Mick Smith (from Burgh Le Marsh) was presented with the Marshal of the Year award for the North East Midlands region. This award, voted far by the 37 clubs in the region is in recognition of Mick's huge contribution to rallies over the years throughout the East Midlands. Come rain, sun, fog, snow or wind on airfields, forests and roadsides Mick has ensured that other competitors have had the opportunity to compete in Motor Sport. Mick is also Clerk of the Course on two stage rallies. Mick Smith receiving Association of North East Midlands Marshal of the Year trophy from Vice President Steve Mugglestone. You do not need a car or be able to drive. The club meets on the last Friday of every month at The George, Alford at 8PM and welcomes any new members.